Refer to the section Company Selection for details on selecting companies to be included in this process. 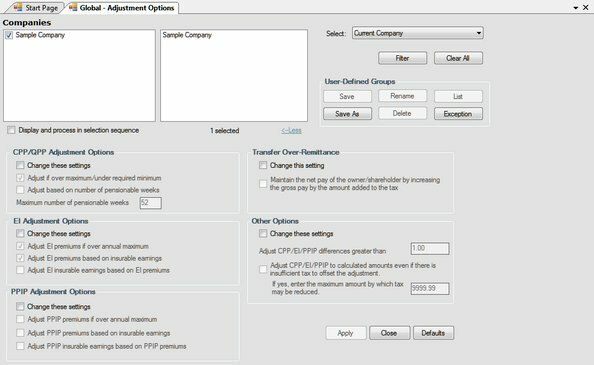 Use the Global Changes - Adjustment Options tool to change the adjustment options for companies in the current database. Click Apply to apply settings in sections with the Change these settings box checked to the selected companies. Changes made here will not apply new adjustments to existing slips and are not retroactive to any adjustments already made. To adjust slips using the new adjustment options you must run the Adjustment Report. Changes made using this tool can not be undone.